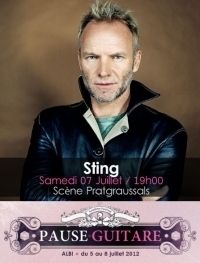 On July 7, Sting will perform many of his most celebrated hits at the Albi Pause Guitare in Albi, France with a 5-piece band including Dominic Miller (guitar), David Sancious (keyboards), Vinnie Colauita (drums), Peter Tickell (electric fiddle), and Jo Lawry (vocals). Fan Club presales will begin at 10AM (local time) tomorrow, Tuesday, March 6. Tickets will go on sale to the public at 10PM (local time) Tuesday, March 6. For the last few weeks, you've been voting on designs for an exclusive Sting.com fan club t-shirt that members will receive as part of the updated 2012 membership package. 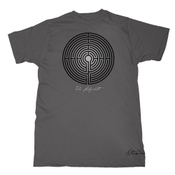 The results are in and it was a very close race…we are pleased to announce that the grey "Gradient" Labyrinth design is the winner! We will soon be contacting members via email for the opportunity to select your preferred size and style (regular fit vs. fitted/babydoll) t-shirt. Stay tuned for more information over the coming weeks, and thanks to everyone who voted! If you've attended any of the Back to Bass concerts, perhaps you've wondered how Sting and the band achieve their distinctive sound. It's part outstanding musicianship... and part Howard Page! In this new clip, the FOH (front of house) engineer and audio extraordinaire describes his role on the Back to Bass tour.